The growth of a guild depends upon the type of gifts they get to unlock everytime with full capacity. ‘With full capacity’ I mean number of members joined in a guild which is limited to 100 only. If all 100 players open a Gold Bonus that means a guild will receive 100,000 Keys. 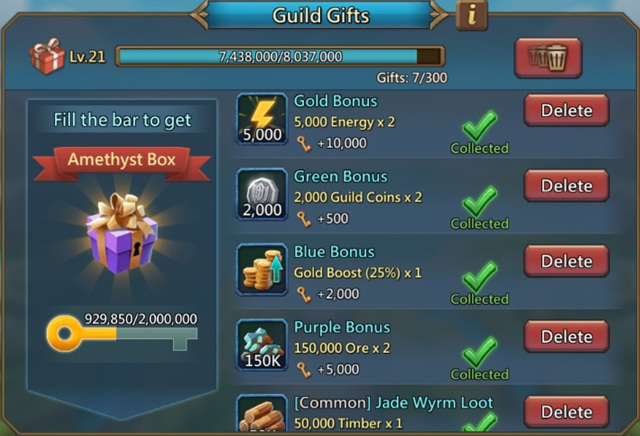 White Bonus, Green Box, Blue Bonus, Purple Bonus and Gold Bonus are only available if a member in your guild purchase bundles. So, It is good for your growth as well as for your guild to have a large number of P2P players. I hope this information will help you and your guild grow smartly faster. Disclaimer: The information is based on personal experience. Knowledge is power. Next Next post: How to increase production?